It began in the Pittsburgh area, years ago. Jan (Deke) Detanna and Rick Budd formed an R & B group called The Del Renos. College beckoned and they both went on to form their own R&B groups in college. The years rolled by, yet Rick and Jan stayed connected. The Doo-Wop stayed alive with duo performances at weddings, parties and reunions. In 2006, Jan and Rick formed a duo called “East Coast” and , recorded two CD's “Sessions” and “Street Corner Harmonies”, featuring the power of four and five part harmony by a duo. Looking for a venue and a vehicle to promote “East Coast”, they attended the 2nd Annual Cool Bobby B‘s Doo-Wop Convention in Las Vegas in November of 2007 signing up for an Amateur Doo-Wop contest. In the course of the first evening, they met Larry D’Angelo, a bassman from the Detroit suburbs, and Lenny Blasso, a baritone from the Baltimore area. After a few hours of doo-wopping under a street lamp, they all realized that something magical was happening. “Deke and the Blazers” was born. The group entered the amateur contest the next day and came in 2nd. In a few short months, the group has managed to pull together from the four corners of the U.S. (Los Angeles, Portland, Baltimore and Detroit) with the high point the opportunity to join the “Ultimate Doo-Wop Show” tour in July of 2008 in Detroit as the opening act. 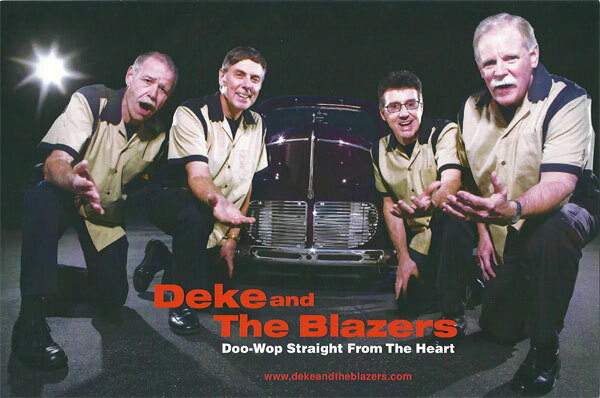 Deke and The Blazers - Click here for Audio 1 / 2.